University of California, Davis, scientists are helping rice farmers in Uruguay stop polluting their waterways -- including drinking-water sources and a globally valuable nature reserve. With funding from the U.S. National Institutes of Health's Fogarty International Center, the UC Davis researchers helped Uruguayan university colleagues devise a simple water test that tells whether it is safe to drain flooded rice fields. The test checks for the herbicide clomazone, which is used on 78 percent of Uruguay's rice fields. Clomazone in high doses can cause liver disease in experimental animals. It also is known to disrupt fish hormones, affecting their ability to reproduce, which becomes a problem for all the plants and animals in the region. However, clomazone usually degrades to safe levels during the rice-growing season. Holding water on the fields for just the right amount of time can make the water safe for streams and rivers, without damaging the farmer's harvest. The new test technology gives scientists a way to determine whether the degradation process is complete; eventually, it should be available to farmers in a simple "dipstick" field test. The farmer would take a few ounces of water from the rice paddy, dip in the test stick, and wait a few minutes for results. If the stick color turns one color, the water is safe to release. If it turns a different color, the farmer should wait a few days and test again. 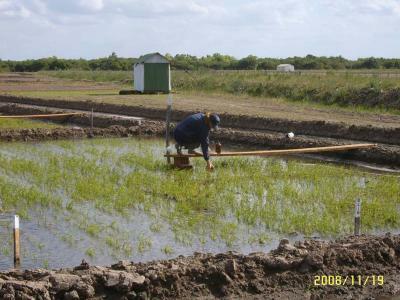 Developing best rice-farming practices to avoid release of toxic chemicals to the environment is especially urgent in Uruguay, because water drained from the country's main area of rice cultivation flows into the marshlands of the Eastern Biosphere Reserve (Reserva de Biosfera Humedales del Este). This reserve is managed as part of the United Nations' UNESCO Man and Biosphere Reserve Program, which promotes environmentally sustainable human development. This reserve is also the headwaters of streams and rivers that provide water to hundreds of thousands of people and millions of birds. In Uruguay, Carlomagno is a graduate student in the laboratory of chemistry professor Gualberto Gonzalez-Sapienza at the University of the Republic in Montevideo. Fogarty funding allowed her to travel to UC Davis as a visiting scholar and train with associate research scientist James Sanborn in entomologist Bruce Hammock's laboratory in the College of Agricultural and Environmental Sciences. Jerold Last, a UC Davis professor of pulmonary, critical-care and sleep medicine, founded and directs the UC Davis Fogarty International Center. The center is an outgrowth of Last's 1999 Fulbright Professorship, during which he lived for six months in Montevideo and in Salta, Argentina, and recognized the needs for advanced training in environmental toxicology in the region. Last founded the Fogarty Center in 2001 to train scientists in South America how to create and use ELISAs and other molecular analyses to enhance public health and environmental protection. "This is a great example of translating basic research expertise at UC Davis to help train an international graduate student who will go home and improve her country's quality of science, protect its environment, and solve a need of its agricultural industry," Last said. The UC Davis Fogarty International Center's annual funding of about $150,000 comes from the National Institutes of Health (NIH) program of the same name. The UC Davis center's activities currently involve three scientists at UC Davis in leadership roles and as many as a dozen more as training faculty, along with four scientists in three South American countries in leadership roles and about 12 more as training faculty, with several dozen South American trainees seeking advanced degrees. Graduate-level courses taught online ("distance learning") to support a new master's degree program in environmental toxicology in Argentina. The U.S. National Institutes of Health's Fogarty International Center is 41 years old, has a $69 million annual budget, and supports global health research and training programs involving about 5,000 scientists in the United States and more than 100 other countries. In one further connection between UC Davis and Uruguay, the fieldwork in Uruguay was funded by a contract from the National Institute for Farming Research (INIA), which is the Uruguayan government agency serving as the research arm of the Uruguayan agricultural industry. The research institute's director, Alvaro Roel, received his doctoral degree in ecology from UC Davis in 2003, then returned to Uruguay to improve the rice industry in his home country. The paper, "A Clomazone Immunoassay to Study the Environmental Fate of the Herbicide in Uruguayan Rice Production," is online at http://pubs.acs.org/doi/abs/10.1021/jf9043259.